The many sides of Tia Brooks. Olympian, collegiate athlete, and college student. 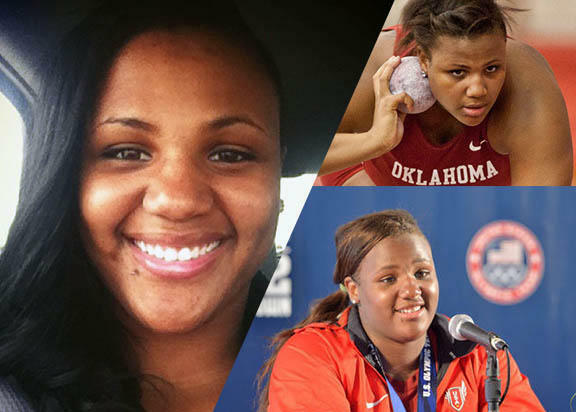 Tia Brooks explains the dualistic nature of being an Olympic athlete and a student at the University of Oklahoma. Tia almost didn’t make it to London after she lost feeling in her legs during her freshman year at OU. The cause was degenerative disk disorder. King: What made you want to go back into this when you knew it is a health risk for you? King: Where ever afraid of playing this sport because it was considered a "male sport"? Brooks: Definitely, I didn’t want to be the stereotypical thrower, like I said the big girl who didn’t run, and wasn’t athletic, but now that I realize that I can maintain my femininity and just get stronger and make strong look beautiful. It’s kind of empowering. King: When you were told that you got picked, what was your reaction? Brooks: I just cried. I was so excited I ran and gave my coach a big hug, and Britney came down and gave me a hug. I was just cringing and I was ecstatic. I don’t know. It was crazy because it didn’t really feel real. It’s been a year and it’s still crazy. King: What were you feeling when you met all of your shot put idols? Brooks: The atmosphere was crazy; you’re with the best in the world. I have competed against the American throwers before so that wasn’t that overwhelming to compete with them, but the European women and you know it was insane because these are the people that I kind of idolized, and whose technique I’ve watched and learned so much from them, so to be there and competing against them was kind of intimidating. 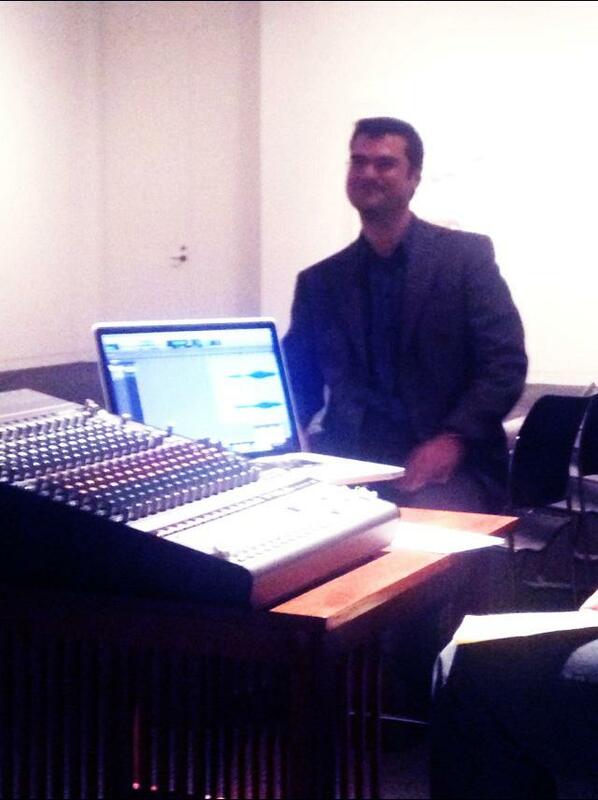 I wasn’t nervous at all, like I was there for a reason, I earned my spot and I worked hard for it. I just felt like I fit. King: What happened? Were people just a whole bunch of competitiveness or was it kind of relaxed? Brooks: I was relaxed. I had that young girl mentality for my first one I was bright-eyed and bushy-tailed and they were just focused. Like they had job to do and they were there to do it. King: What were you thinking right before you threw your shot? Brooks: I hadn’t been having good practices because I’m still l a collegiate athlete and I had a long season before that, so by the time I got there I was mentally, emotionally, and physically drained. So my thought was to just go out there and do the best that I could. King: For the Olympics, what have you’re learned that you’re not going to do next time? Brooks: I have definitely learn how to become a better competitor, I have definitely learned how to adjust to the traveling and stuff that we had to do because I had never been overseas, I had never been on a U.S team, my first international team was the Olympics. So it was so much added stress with the Olympics and so just treating like another meat and just going out there and doing what I know I’m capable of doing. King: When people make a big deal about you going to the Olympics, do you understand their amazement and excitement? Brooks: No, not really. I mean I do, but it is hard to think of myself on the same level as the people that we look up to and idolize. Going there has definitely humbled me and made me realize that celebrities like Kobe Bryant or LeBron James or Maya Moore, they are just like us. I did the same thing they did but it was just a different sport. I don’t understand because I’m the same person that I was before I left. It is a bit overwhelming at times because of people’s reaction, but I definitely understand it. King: Do you like the label” Tia Brooks the Olympian”? Brooks: I mean I do and I don’t. My ability to make a team does not define the person that I am, and I think a lot of people get lost in the title and the name and I don’t want to ever get lost, and my skills go far beyond my abilities to throw a shot put. Yes, it has gotten me places that I could never imagine but at the same time I’m going to have a life after track. King: Do the labels that came with your success also come with some obstacles that you have had to overcome? Brooks: It definitely comes with obstacles; you’re under a little bit of a microscope you have to be more conscious of what you can do. I cannot use the excuse anymore that I’m young anymore because I have people looking up to me and I have people looking to me and I have to make my brand. I have to act like the person I want people to believe that I am. It is definitely a little bit more overwhelming like I said just because you have to be more conscious of what you’re doing. I can’t just live my life; I can’t just be a normal person any more. It is definitely not on the same level others but it’s definitely there. Sometimes I have to remind myself that I am that person, by googling myself and seeing all of the stuff that comes up. It’s crazy! I feel like I’m living a dream, it doesn’t really seem real sometimes. Tia Brooks already has a degree in sociology, but is currently pursuing a degree in African American studies. Her new goals include graduating and going to the 2016 Olympics in Rio. 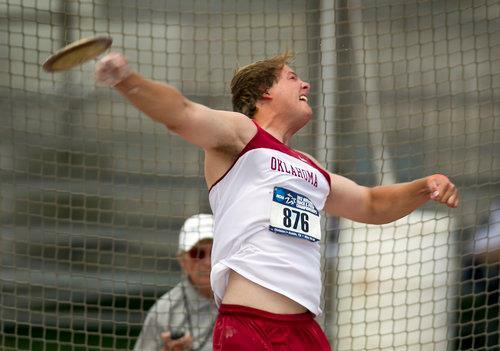 Luke Bryant was on the track team at OU and is currently ranked 6th in the nation. He won big 12 in the discus his freshman and senior years. He also won third at NCAA, and made it to the Olympic trials his senior year. Sitting down in Luke Bryant’s bedroom where dozens of trophies line the walls and shelves, said he first picked up the discus almost by accident.